This is a great little app for on-the-go practice. It has all the major components of American Accent Training – Intonation, Word Connections and Pronunciation, with tons of exercises and audio. There is also a great little recorder, so you can read the lesson, listen to the audio, record yourself, and then compare your voice recording with the model audio. This will train your ear to hear the new sounds and patterns and you'll be able to recognize and reproduce them yourself. Just think, the American accent, in an app, in your pocket, all for $4.99! Also available in Chinese. This is the killer app you've been waiting for! Based on the new book, AAT: Grammar, this is a revolutionary way to learn English. It can be used by beginning, intermediate and advanced students. This program simplifies complex grammar. 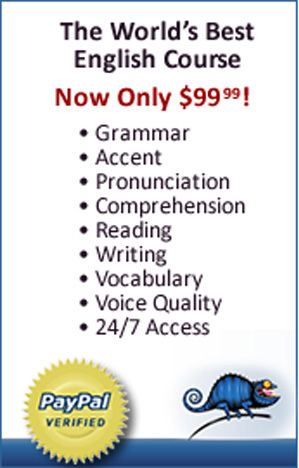 It seamlessly combines grammar, vocabulary, pronunciation, reading, writing, comprehension and the American accent into a simple step-by-step process. The course starts with the most basic grammar and pronunciation and goes through to the most advanced levels in English. Each chapter has five sections: Story, Dictation, Nouns, Verbs, Essay. You have the option of submitting chapter essays online to Grammar.bz. The story and dictations progress from easy to hard. This is a unique way to learn grammar and accent at the same time. The Verb Map lets a learner see how all the verb tenses work. The student has an immediate visual understanding of what he already knows and what remains to be learned. With the English dictionary and the translations on the main page of Grammar.bz, even a true beginner can study without outside help. Intermediate to advanced students will also benefit, as they can fill in any information gaps and master pronunciation at the same time. This is an excellent resource for both ESL students and American students taking English classes. Support is provided at (800) 457-4255. Complete Verb Tenses uses the amazing verb map so you can see all the forms and tenses at a glance. You can zoom in to a specific form, such as the active, passive, negative, continuous, causative, main verbs, the verb To Be, or the question form, and then click each verb tense for professional audio. Learn grammar and pronunciation as well as how complex grammatical structures sound in context. This will let you hear the word connections and intonation patterns of a wide variety of structures. Syllable Stress is a quick and handy app! There are actually rules for where the stress falls in a word, such as a word ending in -tion will always have the stress on the second-to-last syllable. Try it ... intonation, prevarication, somnambulation. It always works! You'll also learn the French words that stress the final syllable, such as garage, pirouette,champagne, etc. As always, there is a great little recorder, so you can learn the rule, read the words, listen to the audio, record yourself, and then compare your voice recording with the model audio. This will train your ear to hear the new sounds and patterns and you'll be able to recognize and reproduce them yourself. This 99¢ app is available now!. It is the story of Max, an Italian bodybuilder who visits America for a while. He gets into all kinds of trouble, meets a lot of people and generally has a great time. It is a series of eight vignettes, each with text and audio. The text is both regular and phonetic, to help with your pronunciation. The regular text has the intonation marked so you can see the stress points and hear them in the audio. It is the same audio as the Max podcast, but you will be able to read the text while listening to the audio, and of course, the fabulous recorder will be available in the app. Also available in Chinese and Japanese! A fun app for learning the amazing art of how to tell a joke. Also learn how to make a joke funny and how to understand the nuances of American humor. This has dozens of jokes with accompanying text so that you can follow the audio as well as a detailed explanation of the word play, misunderstanding, or situation that leads up to the punchline. Every joke also comes with a recorder so that you can compare your delivery to professional American comedians. Also available in Japanese! Mr. Thingamajig is an excellent resource for all ESL students who need to learn the very common substitution words that Americans use ineveryday conversation. Mr. Thing-a-ma-jig tells an amazing story full of doohickeys, thingamajigs and whatchamacallits. Fortunately, it's translated into regular English so you can see what the terms actually mean. There is a recorder available so you can record yourself and compare your voice with the model audio. Across the Pond is great fun! You read the differences between the King's English and the President's English and then actually hear the two versions read by native speakers of the respective countries. This goes way beyond tomay-to / tomah-to and Eliza Doolittle would've been glad to have had this! This app also includes a recorder, so you practice the two accents and listen back to see how you're doing, all for 99¢! American Songbird is an excellent resource for all ESL students and anyone who needs to have an understanding of classic American songs and nursery rhymes. Learn accent and pronunciation as well as American music. This will let you hear the word connections and intonation patterns of popular songs sung for all ages. American Songbird consists of 12 songs, complete with phonetic transcriptions for easy pronunciation. If you have studied Spanish and want to work on your accent, this is the perfect app. It uses the fundamental concepts of intonation, word connections and pronunciation, designed to perfect your Spanish accent. Along with the explanations, there is a built-in recorder, so you can compare your recording with the model audio. There are fun exercises to teach you how to trill your R! This program also includes a big section on the False Friends, (aka false cognates) such as Estoy embarazado, which does not mean I'm embarrassed! There is also a great grammar section that clarifies all the verb tenses for you. This app has the full text of the four gospels, with red letters indicating the words of Jesus. The most commonly used biblical quotes are also included, with audio. Plurals will be a free app with all of the rules beyond add an S. It shows the categories and rules for all kinds of multiples, from knife/knives through to stigma/stigmata. You will also learn the most common irregular plurals such mouse/mice, foot/feet, child/children, etc. Punctuation is the road markers of reading. Just think, stop signs are periods! A great example of how punctuation can change the meaning is: A woman without her man is lost. Versus A woman, without her, man is lost.